Not to be confused with Spratly Island. "Spratly" redirects here. For the surname, see Spratly (surname). 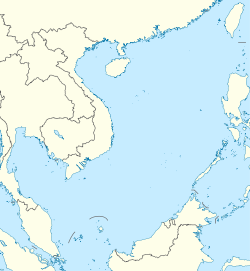 The Spratly Islands (Chinese: 南沙群岛 (Nánshā Qúndǎo), Malay: Kepulauan Spratly, Tagalog: Kapuluan ng Kalayaan, Vietnamese: Quần đảo Trường Sa) are a disputed group of islands, islets and cays and more than 100 reefs, sometimes grouped in submerged old atolls, in the South China Sea. The archipelago lies off the coasts of the Philippines, Malaysia, and southern Vietnam. Named after the 19th-century British whaling captain Richard Spratly who sighted Spratly Island in 1843, the islands contain less than 2 km2 (490 acres) of naturally occurring land area spread over an area of more than 425,000 km2 (164,000 sq mi). 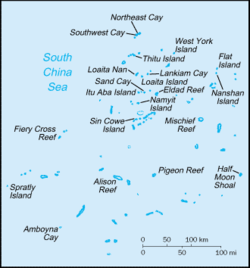 The Spratly Islands were, in 1939, coral islets mostly inhabited by seabirds. Despite the Spratly Islands naturally consisting of 18 islands (see below), according to a Chinese 1986 source, the Spratly Islands consist of 14 islands or islets, 6 banks, 113 submerged reefs, 35 underwater banks, 21 underwater shoals. The northeast part of the Spratlys is known as Dangerous Ground and is characterised by many low islands, sunken reefs, and degraded sunken atolls with coral often rising abruptly from ocean depths greater than 1,000 metres (3,300 ft) – all of which makes the area dangerous for navigation. The islands are all of similar nature; they are cays (or keys): sand islands formed on old degraded and submerged coral reefs. The Spratly Islands contain almost no significant arable land, have no indigenous inhabitants, and very few of the islands have a permanent drinkable water supply. Natural resources include fish, guano, oil and natural gas. Economic activity has included commercial fishing, shipping, guano mining, oil and gas exploitation, and more recently, tourism. The Spratlys are located near several primary shipping lanes. In 1987, China installed a small military structure on Fiery Cross Reef on the pretext to build an oceanic observation station and install a tide gauge for the Global Sea Level Observing System. After a deadly skirmish with the Vietnamese Navy, China installed some military structures on more reefs in the vicinity of the Philippines and Vietnamese occupied islands and this led to escalating tensions between these countries and China over the status and "ownership" of reefs. The total area of archipelago's naturally occurring islands is 177 ha (440 acres) and 200 ha (490 acres) with reclaimed land. The Spratly Islands consist of islands, reefs, banks and shoals that consist of biogenic carbonate. These accumulations of biogenic carbonate lie upon the higher crests of major submarine ridges that are uplifted fault blocks known by geologists as horsts. These horsts are part of a series of parallel and en echelon, half-grabens and rotated fault-blocks. The long axes of the horsts, rotated fault blocks and half-grabens form well-defined linear trends that lie parallel to magnetic anomalies exhibited by the oceanic crust of the adjacent South China Sea. The horsts, rotated fault blocks, and the rock forming the bottoms of associated grabens consist of stretched and subsided continental crust that is composed of Triassic, Jurassic, and Cretaceous strata that include calc-alkalic extrusive igneous rocks, intermediate to acid intrusive igneous rocks, sandstones, siltstones, dark-green claystones, and metamorphic rocks that include biotite–muscovite–feldspar–quartz migmatites and garnet–mica schists. The dismemberment and subsidence of continental crust into horsts, rotated fault blocks and half-grabens that underlie the Spratly Islands and surrounding sea bottom occurred in two distinct periods. They occurred as the result of the tectonic stretching of continental crust along underlying deeply rooted detachment faults. During the Late Cretaceous and Early Oligocene, the earliest period of tectonic stretching of continental crust and formation of horsts, half-grabens, and rotated fault-blocks occurred in association the rifting and later sea-floor spreading that created the South China Sea. During the Late Oligocene-Early Miocene additional stretching and block faulting of continental crust occurred within the Spratly Islands and adjacent Dangerous Ground. During and after this period of tectonic activity, corals and other marine life colonised the crests of the horsts and other ridges that lay in shallow water. The remains of these organisms accumulated over time as biogenic carbonates that comprise the current day reefs, shoals and cays of the Spratly Islands. Starting with their formation in Late Cretaceous, fine-grained organic-rich marine sediments accumulated within the numerous submarine half-grabens that underlie sea bottom within the Dangerous Ground region. The geological surveys show localised areas within the Spratly Islands region are favourable for the accumulation of economic oil and gas reserves. They include thick sequences of Cenozoic sediments east of the Spratly Islands. Southeast and west of them, there also exist thick accumulations of sediments that possibly might contain economic oil and gas reserves lie closer to the Spratly Islands. In some cays in the Spratly Islands, the sand and pebble sediments form the beaches and spits around the island. Under the influence of the dominant wind direction, which changes seasonally, these sediments move around the island to change the shape and size of the island. For example, Spratly Island is larger during the northeast monsoon (about 700 × 300 meters), and smaller during the southwest monsoon (approximately 650 × 320 meters). Some islands may contain fresh groundwater fed by rain. Groundwater levels fluctuate during the day with the rhythm of the tides. Phosphates from bird faeces (guano) are mainly concentrated in the beach rocks by the way of exchange-endosmosis. The principal minerals bearing phosphate are podolite, lewistonite and dehonite. Coral reefs are the predominant structures of these islands; the Spratly group contains over 600 coral reefs in total. In April 2015 the New York Times reported that China were using "scores of dredgers" to convert Fiery Cross Reef and several other reefs into military facilities. Little vegetation grows on these islands, which are subject to intense monsoons. Larger islands are capable of supporting tropical forest, scrub forest, coastal scrub and grasses. It is difficult to determine which species have been introduced or cultivated by humans. Taiping Island (Itu Aba) was reportedly covered with shrubs, coconut, and mangroves in 1938; pineapple was also cultivated there when it was profitable. Other accounts mention papaya, banana, palm, and even white peach trees growing on one island. A few islands that have been developed as small tourist resorts had soil and trees brought in and planted where there was none. A total of 2,927 marine species have been recorded in the Spratly Sea, including 776 benthic species, 382 species of hard coral, 524 species of marine fish, 262 species of algae and sea grass, 35 species of seabirds, and 20 species of marine mammals and sea turtles. Terrestrial vegetation in the islands includes 103 species of vascular plants of magnolia branches (Magnoliophyta) of 39 families and 79 genera. The islands that do have vegetation provide important habitats for many seabirds and sea turtles. Both the green turtle (Chelonia mydas, endangered) and the hawksbill turtle (Eretmochelys imbricata, critically endangered) formerly occurred in numbers sufficient to support commercial exploitation. These species reportedly continue to nest even on islands inhabited by military personnel (such as Pratas) to some extent, though it is believed that their numbers have declined. Seabirds use the islands as resting, breeding, and wintering sites. Species found here include streaked shearwater (Calonectris leucomelas), brown booby (Sula leucogaster), red-footed booby (S. sula), great crested tern (Sterna bergii), and white tern (Gygis alba). Little information is available regarding the current status of the islands' seabird populations, though it is likely that birds may divert nesting sites to smaller, less disturbed islands. Bird eggs cover the majority of Southwest Cay, a small island in the eastern Danger Zone. A variety of cetaceans such as dolphins, orcas, pilot whales, and sperm whales are also present around the islands. This ecoregion is still largely a mystery. Scientists have focused their research on the marine environment, while the ecology of the terrestrial environment remains relatively unknown. Political instability, tourism and the increasing industrialisation of neighbouring countries has led to serious disruption of native flora and fauna, over-exploitation of natural resources, and environmental pollution. Disruption of nesting areas by human activity and/or by introduced animals, such as dogs, has reduced the number of turtles nesting on the islands. Sea turtles are also slaughtered for food on a significant scale. The sea turtle is a symbol of longevity in Chinese culture and at times the military personnel are given orders to protect the turtles. Heavy commercial fishing in the region incurs other problems. Although it has been outlawed, fishing methods continue to include the use of bottom trawlers fitted with chain rollers. In 1994 a routine patrol by Taiwan's marine navy confiscated more than 200 kg of potassium cyanide solution from fishermen who had been using it for cyanide fishing. These activities have a devastating impact on local marine organisms and coral reefs. Some interest has been taken[by whom?] in regard to conservation of these[which?] island ecosystems. J.W. McManus, professor of marine biology and ecology at the University of Miami's Rosenstiel School of Marine and Atmospheric Science, has explored the possibilities of designating portions of the Spratly Islands as a marine park. One region of the Spratly Archipelago, named Truong Sa, was proposed by Vietnam's Ministry of Science, Technology, and the Environment (MOSTE) as a future protected area. The site, with an area of 160 km2 (62 sq mi), is currently managed by the Khánh Hòa Provincial People's Committee of Vietnam. Military groups in the Spratlys have engaged in environmentally damaging activities such as shooting turtles and seabirds, raiding nests and fishing with explosives. The collection of rare medicinal plants, collecting of wood, and hunting for the wildlife trade are common threats to the biodiversity of the entire region, including these islands. Coral habitats are threatened by pollution, over-exploitation of fish and invertebrates, and the use of explosives and poisons as fishing techniques. A 2014 United Nations Environment Programme (UNEP) report said: "Sand is rarer than one thinks". The average price of sand imported by Singapore was US$3 per tonne from 1995 to 2001, but the price increased to US$190 per tonne from 2003 to 2005. Although the Philippines and China had both ratified the UNCLOS III, in the case of and Johnson South Reef, Hughes Reef, Mischief Reef, the PRC dredged sand for free in the EEZ the Philippines had claimed from 1978 arguing this is the "waters of China's Nansha Islands". Although the consequences of substrate mining are hidden, they are tremendous. Aggregate particles that are too fine to be used are rejected by dredging boats, releasing vast dust plumes and changing water turbidity. John McManus, a professor of marine biology and ecology at the Rosenstiel School of Marine and Atmospheric Science, said: "The worst thing anyone can do to a coral reef is to bury it under tons of sand and gravel ... There are global security concerns associated with the damage. It is likely broad enough to reduce fish stocks in the world's most fish-dependent region." He explained that the reason "the world has heard little about the damage inflicted by the Peoples [sic] Republic of China to the reefs is that the experts can't get to them" and noted "I have colleagues from the Philippines, Taiwan, PRC, Vietnam and Malaysia who have worked in the Spratly area. Most would not be able to get near the artificial islands except possibly some from PRC, and those would not be able to release their findings." Records show the islands as inhabited at various times in history by Chinese and Vietnamese fishermen, and during the Second World War by troops from French Indochina and Japan. However, there is no record of large settlements on the islands until 1956, when Filipino adventurer Tomás Cloma, Sr., decided to "claim" a part of Spratly islands as his own, naming it the "Free Territory of Freedomland". Evidence of human presence in the region extends back nearly 50,000 years at Tabon Caves on Palawan. Therefore, it is difficult to say when humans first came upon this island group. Within historical times, several groups may have passed through or occupied the islands. Between 600 BC to 3 BC there was an East to West migration by members of the seafaring Sa Huỳnh culture. This may have led them through the Spratly Islands on their way to Vietnam. These migrants were the forebears of the Cham people, an Austronesian-speaking people that founded the Old Champa empire that ruled what was known for centuries as the Champa Sea. Mao Kun map, Spratly Islands is suggested to be the islands at the bottom right (石星石塘; shíxīng shítáng). Identification of these islands however may vary, some for example marked them as Macclesfield Bank. In the Song Dynasty work Zhu fan zhi by Zhao Rugua, the name "Thousand Li Stretch of Sands" (Qianli Changsha, 千里長沙) and the "Ten-Thousand Li of Stone Pools/Beds" (Wanli Shitang 萬里石塘, or Wanli Shichuang 萬里石床) were given, interpreted by some to refer to Paracel and Spratly respectively. Wanli Shitang is also recorded in the History of Yuan to have been explored by the Chinese during the Mongol-led Yuan dynasty and may have been considered by them to have been within their national boundaries. However, the Yuan also ruled over Korea, Mongolia, and parts of modern Russia. They are also referenced, sometimes with different names, in the Ming dynasty. 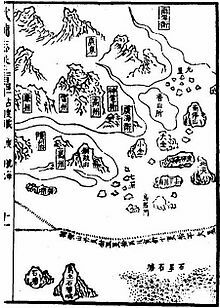 For example, in the Mao Kun map dating from Zheng He's voyage of the early 15th century, Shixing Shitang (石星石塘) is taken by some to mean Spratly, however different authors interpret the identities of these islands differently. Another Ming text, Haiyu (海語, On the Sea), uses Wanli Changsha (萬里長沙) for Spratly and noted that it is located southeast of Wanli Shitang (Paracels). When the Ming Dynasty collapsed, the Qing dynasty continued to include the territory in maps compiled in 1724, 1755, 1767, 1810, and 1817, but did not officially claim jurisdiction over these islands. An 1838 Unified Dai Nam map marking Trường Sa and Hoàng Sa, which are considered as Spratly and Paracel Islands by Vietnamese scholars; yet they share different latitude, location, shape and distance. A Vietnamese map from 1834 also combines the Spratly and Paracel Islands into one region known as "Vạn Lý Trường Sa", a feature commonly incorporated into maps of the era (萬里長沙) ‒ that is, the same as the aforementioned Chinese island name Wanli Changsha. 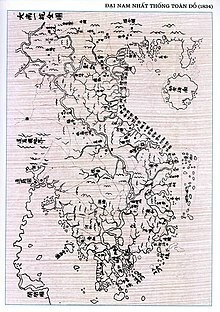 According to Hanoi, Vietnamese maps record Bãi Cát Vàng (Golden Sandbanks, referring to both the Spratly and Paracel Islands), which lay near the coast of the central Vietnam, as early as 1838. In Phủ Biên Tạp Lục (The Frontier Chronicles) by scholar Lê Quý Đôn, both Hoàng Sa and Trường Sa were defined as belonging to the Quảng Ngãi District. He described it as where sea products and shipwrecked cargoes were available to be collected. Vietnamese text written in the 17th century referenced government-sponsored economic activities during the Lê dynasty, 200 years earlier. 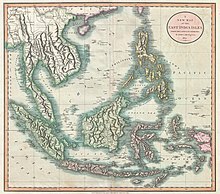 The Vietnamese government conducted several geographical surveys of the islands in the 18th century. A striking large black and white British chart of the sea in northern Borneo, first issued in 1881 and corrected to 1935. Despite the fact that China and Vietnam both made a claim to these territories simultaneously, at the time, neither side was aware that its neighbour had already charted and made claims to the same stretch of islands. An early European map, A correct chart of the China Seas of 1758 by William Herbert, left the Spratly Islands region (known then as the Dangerous Ground) as largely blank, indicating that region has yet to be properly surveyed, although some islands and shoals at its western edge were marked (one appears at the same place as Thitu Island). A number of maps of the South China Sea were later produced, but the first map that gives a reasonably accurate delineation of the Spratly Islands region (titled [South] China Sea, Sheet 1) was only published in 1821 by the hydrographer of the East India Company James Horsburgh after a survey by Captain Daniel Ross. A later 1859 edition of the map named the Spratly Island as Storm Island. The islands were sporadically visited throughout the 19th and early 20th centuries by mariners from different European powers (including Richard Spratly, after whom the island group derives its most recognisable English name, who visited the group in the 1840s in his whaler Cyrus). However, these nations showed little interest in the islands. In 1883, German boats surveyed the Spratly and the Paracel Islands but eventually withdrew the survey, after receiving protests from the Guangdong government representing the Qing dynasty. China sent naval forces on inspection tours in 1902 and 1907 and placed flags and markers on the islands. In the 1950s, a group of individuals claimed sovereignty over the islands in the name of Morton F. Meads, supposedly an American descendant of a British naval captain who gave his name to Meads Island (Itu Aba) in the 1870s. In an affidavit made in 1971, the group claimed to represent the Kingdom of Humanity/Republic of Morac-Songhrati-Meads, which they asserted was in turn the successor entity for a supposed Kingdom of Humanity established between the two world wars on Meads Island, allegedly by the son of the British captain. This claim to this would-be micronation fell dormant after 1972, when several members of the group drowned in a typhoon. In the 19th century, Europeans found that Chinese fishermen from Hainan annually sojourned on the Spratly islands for part of the year, while in 1877 it was the British who launched the first modern legal claims to the Spratlys. When the Spratlys and Paracels were surveyed by Germany in 1883, China issued protests against them. The 1887 Chinese-Vietnamese Boundary convention signed between France and China after the Sino-French War said that China was the owner of the Spratly and Paracel islands. China sent naval forces on inspection tours in 1902 and 1907 and placed flags and markers on the islands. The Qing dynasty's successor state, the Republic of China, claimed the Spratly and Paracel islands under the jurisdiction of Hainan. In 1933, France asserted its claims to the Spratly and Paracel Islands on behalf of its then-colony Vietnam. It occupied a number of the Spratly Islands, including Taiping Island, built weather stations on two of the islands, and administered them as part of French Indochina. This occupation was protested by the Republic of China (ROC) government because France admitted finding Chinese fishermen there when French warships visited nine of the islands. In 1935, the ROC government also announced a sovereignty claim on the Spratly Islands. Japan occupied some of the islands in 1939 during World War II, and it used the islands as a submarine base for the occupation of Southeast Asia. During the Japanese occupation, these islands were called Shinnan Shoto (新南諸島), literally the New Southern Islands, and together with the Paracel Islands (西沙群岛), they were put under the governance of the Japanese colonial authority in Taiwan. Japan occupied the Paracels and the Spratlys from February 1939 to August 1945. Japan annexed the Spratlys via Taiwan's jurisdiction and the Paracels via Hainan's jurisdiction. Parts of the Paracels and Spratlys were again controlled by Republic of China after the 1945 surrender of Japan, since the Allied powers assigned the Republic of China to receive Japanese surrenders in that area, however no successor was named to the islands. In November 1946, the ROC sent naval ships to take control of the islands after the surrender of Japan. It had chosen the largest and perhaps the only inhabitable island, Taiping Island, as its base, and it renamed the island under the name of the naval vessel as Taiping. Also following the defeat of Japan at the end of World War II, the ROC re-claimed the entirety of the Spratly Islands (including Taiping Island) after accepting the Japanese surrender of the islands based on the Cairo and Potsdam Declarations. The Republic of China then garrisoned Itu Aba (Taiping) island in 1946 and posted Chinese flags. The aim of the Republic of China was to block the French claims. The Republic of China drew up the map showing the U-shaped claim on the entire South China Sea, showing the Spratly and Paracels in Chinese territory, in 1947. Japan had renounced all claims to the islands in the 1951 San Francisco Peace Treaty together with the Paracels, Pratas and other islands captured from the Chinese, and upon these declarations, the government of the Republic of China reasserted its claim to the islands. The Chinese Kuomintang force withdrew from most of the Spratly and Paracel Islands after they retreated to Taiwan from the opposing Communist Party of China due to their losses in the Chinese Civil War and the founding of the People's Republic of China (PRC) in 1949. Taiwan quietly withdrew troops from Taiping Island in 1950, but then reinstated them in 1956 in response to Tomás Cloma's sudden claim to the island as part of Freedomland. As of 2013[update], Taiping Island is administered by Taiwan. After pulling out its garrison in 1950 when the Republic of China evacuated to Taiwan, when the Filipino Tomas Cloma uprooted an ROC flag on Itu Aba laid claim to the Spratlys and, Taiwan again regarrisoned Itu Aba in 1956. In 1946, the Americans allegedly reminded the Philippines at its independence that the Spratlys was not Philippine territory, both to not anger Chiang Kai-shek in China and because the Spratlys were not part of the Philippines per the 1898 treaty Spain signed with America. However, no document was found to that effect. The Philippines then claimed the Spratlys in 1971 under President Marcos, after Taiwanese troops attacked and shot at a Philippine fishing boat on Itu Aba. Taiwan's garrison from 1946–1950 and 1956-now on Itu Aba represents an "effective occupation" of the Spratlys. China established a coastal defence system against Japanese pirates or smugglers. In 1958, China issued a declaration defining its territorial waters that encompassed the Spratly Islands. North Vietnam's prime minister, Phạm Văn Đồng, sent a formal note to Zhou Enlai, stating that the Government of the Democratic Republic of Vietnam (DRV) respected the Chinese decision regarding the 12 nmi (22 km; 14 mi) limit of territorial waters. While accepting the 12-nmi principal with respect to territorial waters, the letter did not actually address the issue of defining actual territorial boundaries. North Vietnam recognised China's claims on the Paracels and Spratlys during the Vietnam War as it was being supported by China. Only after winning the war and conquering South Vietnam did North Vietnam retract its recognition and admitted it recognised them as part of China to receive aid from China in fighting the Americans. In 1988, the Vietnamese and Chinese navies engaged in a skirmish in the area of Johnson South Reef (also called Yongshu reef in China and Mabini reef in Philippines). Under President Lee Teng-hui, Taiwan stated that "legally, historically, geographically, or in reality", all of the South China Sea and Spratly islands were Taiwan's territory and under Taiwanese sovereignty, and denounced actions undertaken there by Malaysia and the Philippines, in a statement on 13 July 1999 released by the foreign ministry of Taiwan. Taiwan and China's claims "mirror" each other; during international talks involving the Spratly islands, China and Taiwan have cooperated with each other since both have the same claims. It was unclear whether France continued its claim to the islands after World War II, since none of the islands, other than Taiping Island, was habitable. The South Vietnamese government took over the Trường Sa administration after the defeat of the French at the end of the First Indochina War. "The French bestowed its titles, rights, and claims over the two island chains to the Republic of Vietnam (RoV) in accordance with the Geneva Accords", said Nguyen Hong Thao, Associate Professor at Faculty of Law, Vietnam National University. In 1999, a Philippine navy ship (Number 57 – BRP Sierra Madre) was purposely run aground near Second Thomas Shoal to enable establishment of an outpost. As of 2014[update] it had not been removed, and Filipino marines have been stationed aboard since the grounding. Taiwan and mainland China are largely strategically aligned on the Spratly islands issue, since they both claim exactly the same area, so Taiwan's control of Itu Aba (Taiping) island is viewed as an extension of China's claim. Taiwan and China both claim the entire island chain, while all the other claimants only claim portions of them. China has proposed co-operation with Taiwan against all the other countries claiming the islands. Taiwanese lawmakers have demanded that Taiwan fortify Itu Aba (Taiping) island with weapons to defend against the Vietnamese, and both China and Taiwanese NGOs have pressured Taiwan to expand Taiwan's military capabilities on the island, which played a role in Taiwan expanding the island's runway in 2012. China has urged Taiwan to co-operate and offered Taiwan a share in oil and gas resources while shutting out all the other rival claimants. Taiwanese lawmakers have complained about repeated Vietnamese aggression and trespassing on Taiwan's Itu Aba (Taiping), and Taiwan has started viewing Vietnam as an enemy over the Spratly Islands, not China. Taiwan's state run oil company CPC Corp's board director Chiu Yi has called Vietnam as the "greatest threat" to Taiwan. Taiwan's airstrip on Taiping has irritated Vietnam. China views Taiwan's expansion of its military and airstrip on Taiping as benefiting China's position against the other rival claimants from southeast Asian countries. China's claims to the Spratlys benefit from legal weight because of Taiwan's presence on Itu Aba, while America on the other hand has regularly ignored Taiwan's claims in the South China Sea and does not include Taiwan in any talks on dispute resolution for the area. Taiwan performed live fire military exercises on Taiping island in September 2012; reports said that Vietnam was explicitly named by the Taiwanese military as the "imaginary enemy" in the drill. Vietnam protested against the exercises as violation of its territory and "voiced anger", demanding that Taiwan stop the drill. Among the inspectors of the live fire drill were Taiwanese national legislators, adding to the tensions. In May 2011, Chinese patrol boats attacked two Vietnamese oil exploration ships near the Spratly Islands. Also in May 2011, Chinese naval vessels opened fire on Vietnamese fishing vessels operating off East London Reef (Da Dong). The three Chinese military vessels were numbered 989, 27 and 28, and they showed up with a small group of Chinese fishing vessels. Another Vietnamese fishing vessel was fired on near Fiery Cross Reef (Chu Thap). The Chief Commander of Border Guards in Phú Yên Province, Vietnam reported that a total of four Vietnamese vessels were fired upon by Chinese naval vessels. [not in citation given] These incidents involving Chinese forces sparked mass protests in Vietnam, especially in Hanoi and Ho Chi Minh City, and in various Vietnamese communities in the West (namely in the US state of California and in Paris) over attacks on Vietnamese citizens and the intrusion into what Vietnam claimed was part of its territory. In June 2011, the Philippines began officially referring to the South China Sea as the "West Philippine Sea" and the Reed Bank as "Recto Bank". In July 2012, the National Assembly of Vietnam passed a law demarcating Vietnamese sea borders to include the Spratly and Paracel Islands. In 2010, it was reported that the former Malaysian Prime Minister (now the current Malaysian Prime Minister) Mahathir Mohamad believed Malaysia could profit from China's economic growth through co-operation with China, and said that China "was not a threat to anyone and was not worried about aggression from China", as well accusing the United States of provoking China and trying to turn China's neighbours against China. Malaysian authorities displayed no concern over China conducting a military exercise at James Shoal in March 2013, with its Defence Minister Hishamuddin Hussein suggested they might work with China and saying that Malaysia had no problem with China patrolling the South China Sea, and telling ASEAN, America, and Japan that "Just because you have enemies, doesn't mean your enemies are my enemies". However, until present Malaysia still maintained a balance relations with the countries involved in this dispute. But since China has start enroaching its territorial waters, Malaysia has become active in condemning China. The editorial of the Taiwanese news website Want China Times accused America of being behind the May 2014 flareup in the South China Sea, saying that Vietnam rammed a Chinese vessel on 2 May over an oil rig drilling platform and the Philippines detained 11 Chinese fishermens occurred because of Obama's visit to the region and that they were incited by America "behind the scenes". Want China Times claimed America ordered Vietnam on 7 May to complain about the drilling platform, and noted that a joint military exercise was happening at this time between the Philippines and America, and also noted that the American New York Times newspaper supported Vietnam. In a series of news stories on 16 April 2015, it was revealed, through photos taken by Airbus, that China had been building an airstrip on Fiery Cross Reef, one of the southern islands. The 10,000-foot-long (3,048 m) runway covers a significant portion of the island, and is viewed as a possible strategic threat to other countries with claims to the islands, such as Vietnam and the Philippines. Champa historically had a large presence in the South China Sea. The Vietnamese broke Champa's power in an invasion of Champa in 1471, and then finally conquered the last remnants of the Cham people in an invasion in 1832. A Cham named Katip Suma who received Islamic education in Kelantan declared a Jihad against the Vietnamese, and fighting continued until the Vietnamese crushed the remnants of the resistance in 1835. The Cham organisation Front de Libération du Champa was part of the United Front for the Liberation of Oppressed Races, which waged war against the Vietnamese for independence in the Vietnam War along with the Montagnard and Khmer Krom minorities. The last remaining FULRO insurgents surrendered to the United Nations in 1992. The Vietnamese government fears that evidence of Champa's influence over the disputed area in the South China Sea would bring attention to human rights violations and killings of ethnic minorities in Vietnam such as in the 2001 and 2004 uprisings, and lead to the issue of Cham autonomy being brought into the dispute, since the Vietnamese conquered the Hindu and Muslim Cham people in a war in 1832. Japanese scholar Taoka Shunji criticised Japanese Prime Minister Shinzō Abe for trying to falsely portray China as a threat to Japan and that it was invading its neighbours like the Philippines, and pointed out that the Spratly islands were not part of the Philippines when the US acquired the Philippines from Spain in the Treaty of Paris in 1898, and the Japanese-ruled Taiwan itself had annexed the Spratly islands in 1938 and the US ruled Philippines did not challenge the move and never asserted that it was their territory. He also pointed out that other countries did not need to do full land reclamation since they already control islands and that the reason China engaged in extensive land reclamation is because they needed it to build airfields since China only has control over reefs. The "Moro" as "people", is used to describe both the Filipino Muslims and their homeland. Ancestors of moro people were the owners of Spratly Islands prior to the arrival of the Spanish colonials in the 16th century, according to the Sultan of Sulu in the southern Philippines reported in a local paper. “China has no right over the Spratly Islands in what it calls the South China Sea because that is part of our ancestral domain,” Majaraj Julmuner Jannaral, Sultanate information officer, told the Philippine Star. “The Spratly Archipelago is part of the Sulu Sea (the inner area around the islands in the southern Philippines, which is part of the West Philippine Sea (the new name of the South China Sea),” Jannaral concluded. "Exploration of the marine territory and the waters around the Spratly Archipelago, Palawan in southwestern Philippines and the southern Philippines, belong to the residents in those areas," he added. The Moro National Liberation Front (MNLF) of Nur Misuari, based in Sulu, declared its support for China against the Philippines in the South China Sea dispute, calling both China and the Moro people victims of Philippine colonialism, and noting China's history of friendly relations with the Moros. The MNLF also denounced America's assistance to the Philippines in their colonisation of the Moro people in addition to denouncing the Philippines claims to the islands disputed with China, and denouncing America for siding with the Philippines in the dispute, noting that in 1988 China "punished" Vietnam for attempting to set up a military presence on the disputed islands, and noting that the Moros and China maintained peaceul relations, while on the other hand the Moros had to resist other colonial powers, having to fight the Spanish, fight the Americans, and fight the Japanese, in addition to fighting the Philippines. In January 2013, the Philippines formally initiated arbitration proceedings against China's claim on the territories within the "nine-dash line" that includes Spratly Islands, which it said is "unlawful" under the United Nations Convention on the Law of the Sea (UNCLOS). An arbitration tribunal was constituted under Annex VII of UNCLOS and it was decided in July 2013 that the Permanent Court of Arbitration (PCA) would function as registry and provide administrative duties in the proceedings. On 12 July 2016, the arbitrators of the tribunal of PCA agreed unanimously with the Philippines. They concluded in the award that there was no evidence that China had historically exercised exclusive control over the waters or resources, hence there was "no legal basis for China to claim historic rights" over the nine-dash line. Accordingly, the PCA tribunal decision is ruled as final and non-appealable by either countries. The tribunal also criticized China's land reclamation projects and its construction of artificial islands in the Spratly Islands, saying that it had caused "severe harm to the coral reef environment". It also characterized Taiping Island and other features of the Spratly Islands as "rocks" under UNCLOS, and therefore are not entitled to a 200 nautical mile exclusive economic zone. China however rejected the ruling, calling it "ill-founded". Taiwan, which currently administers Taiping Island, the largest of the Spratly Islands, also rejected the ruling. Swallow Reef Malaysia Layang-Layang Airport LAC 1995 1,367 m Dual-use concrete airport. Fiery Cross Reef China Yongshu Airport AG 4553 2016 3,300 m (est.) Dual-use concrete airport. Subi Reef China Zhubi Airport 2016 3,300 m (est.) Dual-use concrete airport. Mischief Reef China Meiji Airport 2016 2,700 m (est.) Dual-use concrete airport. Thitu Island (Pag-asa) Philippines Rancudo Airfield RPPN 1975 1,300 m (est.) Concrete. Spratly Island (Trường Sa) Vietnam Trường Sa Airport 1976-77 1,200 m (est.) Military use only. Extended from 600m to 1,200m in 2016. In 2005, a cellular phone base station was erected by the Philippines' Smart Communications on Pag-asa Island. On 18 May 2011, China Mobile announced that its mobile phone coverage has expanded to the Spratly Islands. The extended coverage would allow soldiers stationed on the islands, fishermen, and merchant vessels within the area to use mobile services, and can also provide assistance during storms and sea rescues. The service network deployment over the islands took nearly one year. SSN, a computer game set during a conflict over the Spratly Islands. ^ Black type is used for islands, and for those reefs and shoals that have portions above water at high tide. Blue type is used for submerged features. Erratum: Hughes Reef is wrongly labelled Chigua Reef, a name of Johnson South Reef in Chinese, part of the same Union Banks sunken atoll. ^ Anda, Redempto (17 July 2012). "Government told of China buildup 2 months ago". Philippine Inquirer. Retrieved 29 October 2013. ^ a b Claudius Madrolle (1939). "La question de Hai-nan et des Paracels" [The question of Hai-nan and Paracel]. Politique étrangère (in French). 4 (3): 302–312. doi:10.3406/polit.1939.5631. ^ a b c d e f g h i j "South China Sea Islands". Terrestrial Ecoregions. World Wildlife Fund. ^ a b Owen, N. A. and C. H. Schofield, 2012, Disputed South China Sea hydrocarbons in perspective. Marine Policy. vol. 36, no. 3, pp. 809–822. ^ "Q&A: South China Sea dispute". Retrieved 30 October 2013. ^ "The Impact of Artificial Islands on Territorial Disputes Over The Spratly Islands, by Zou Keyuan". ^ Mark E. Rosen (18 July 2016). "China Has Much to Gain From the South China Sea Ruling". The Diplomat. Retrieved 27 April 2017. ^ Note, however, that a 2013 US EIA report questions the economic viability of many of the potential reserves. ^ "Sandcastles of their own: Vietnamese Expansion in the Spratly Islands". ^ See List of maritime features in the Spratly Islands for information about individual islands. ^ User, S. (1990). "Pasukan Gugusan Semarang Peninjau". Retrieved 4 June 2013. ^ "Slow progress on capability growth". Defence Review Asia.com. 22 November 2011. Retrieved 4 December 2014. ^ "LAWATAN OPERASI KAPAL TENTERA DARAT AMERIKA SYARIKAT, CW3 HAROLD C CLINGER KE PULAU PINANG". ^ a b Hutchison, C. S., and V. R. Vijayan, 2010, What are the Spratly Islands? Journal of Asian Earth Science. vol. 39, no. 5, pp. 371–385. ^ a b Wei-Weil, D., and L, Jia-Biao, 2011, Seismic Stratigraphy, Tectonic Structure and Extension Factors Across the Dangerous Grounds: Evidence from Two Regional Multi-Channel Seismic Profiles. Chinese Journal of Geophysics. vol. 54, no. 6, pp. 921–941. ^ a b Zhen, S., Z. Zhong-Xian, L. Jia-Biao, Z. Di, and W. Zhang-Wen, 2013, Tectonic Analysis of the Breakup and Collision Unconformities in the Nansha Block. Chinese Journal of Geophysics. vol. 54, no. 6, pp. 1069–1083. ^ Blanche, J. B. and J. D. Blanche, 1997, An Overview of the Hydrocarbon Potential of the Spratly Islands Archipelago and its Implications for Regional Development. in A. J. Fraser, S. J. Matthews, and R. W. Murphy, eds., pp. 293–310, Petroleum Geology of South East Asia. Special Publication no. 126, The Geological Society, Bath, England 436 pp. ^ Tran Duc Thanh (May 1994). "Động lực bồi tụ, xói lở bờ và sự thay đổi hình dạng đảo san hô Trường Sa" [Deposition and erosion dynamics and shape change of the Spratly coral island]. ResearchGate. Retrieved 28 July 2014. ^ Tran Duc Thanh (May 1994). "Kết quả khảo sát bước đầu nước ngầm đảo san hô Trường Sa" [Results of preliminary survey for groundwater in Spratly coral Island]. ResearchGate. Retrieved 28 July 2014. ^ "Một số đặc điểm địa chất đảo san hô Trường Sa – Some geological features of Spratly coral Island". ResearchGate. 21 May 2014. Retrieved 28 July 2014. ^ Perlez, Jane (17 April 2015). "China Building Aircraft Runway in Disputed Spratly Islands". The New York Times. ^ Watkins, Derek (30 July 2015). "What China Has Been Building in the South China Sea". The New York Times. ^ a b "Vietnamese sea and islands – position, resources and typical geological and ecological wonders". researchgate.net. ^ "中国海南赴南沙捕捞船队遇海豚领航 – 中国新闻 – 纽约华人网". ^ Hoyt E. (2012). Marine Protected Areas for Whales, Dolphins and Porpoises: A World Handbook for Cetacean Habitat Conservation and Planning. Routledge. p. 307. ISBN 978-1-136-53830-8. Retrieved 6 April 2016. ^ Ponnampalam S.L. (2012). "Opportunistic observations on the distribution of cetaceans in the Malaysian South China, Sulu and Sulawesi Seas and an updated checklist of marine mammals in Malaysia" (pdf). Raffles Bulletin of Zoology. 60 (1): 221–231. Retrieved 6 April 2016. ^ Cheng, I-Jiunn (July 1995). "Sea Turtles At Dungsha Tao, South China Sea". Marine Turtle Newslatter. 70: 13–14. Retrieved 17 December 2016. ^ a b c d "Sand, rarer than one thinks" (PDF). 1 March 2014. p. 41. ^ a b Shahriman Lockman (24 April 2013). "Why Malaysia isn't afraid of China (for now)". The Strategist: The Australian Strategic Policy Institute Blog. Retrieved 14 May 2014. ^ "PRESIDENTIAL DECREE No. 1599 ESTABLISHING AN EXCLUSIVE ECONOMIC ZONE AND FOR OTHER PURPOSES". Chan Robles Law Library. 11 June 1978. ^ "Timeline". History of the Spratlys. www.spratlys.org. Archived from the original on 21 March 2014. Retrieved 21 March 2014. ^ Chemillier-Gendreau, Monique (2000). Sovereignty Over the Paracel and Spratly Islands. Kluwer Law International. ISBN 978-9041113818. ^ China Sea pilot. 1 (8th ed.). Taunton: UKHO – United Kingdom Hydrographic Office. 2010. ^ "China and Philippines: The reasons why a battle for Zhongye (Pag-asa) Island seems unavoidable". China Daily Mail. 13 January 2014. Retrieved 21 March 2014. ^ "The Cham: Descendants of Ancient Rulers of South China Sea Watch Maritime Dispute From Sidelines". National Geographic. 18 June 2014. Retrieved 29 June 2015. ^ a b J.V. Mills (1970). Ying-Yai Sheng-Lan: 'The Overall Survey of the Ocean's Shores. White Lotus Press. pp. Appendix 1 and 2. ISBN 978-974-8496-78-8. ^ Jianming Shen (1998). Myron H. Nordquist; John Norton Moore (eds.). Security Flashpoints: Oil, Islands, Sea Access and Military Confrontation. Brill. pp. 156–159. ISBN 978-9041110565. ^ Jianming Shen (1998), "Territorial Aspects of the South China Sea Island Disputes", in Nordquist, Myron H.; Moore, John Norton (eds. ), Security Flashpoints: Oil, Islands, Sea Access and Military Confrontation, Martinus Nijhoff Publishers, pp. 165–166, ISBN 978-90-411-1056-5 , ISBN 90-411-1056-9 ISBN 978-90-411-1056-5. ^ "Ministry of Foreign Affairs of the People's Republic of China". fmprc.gov.cn. ^ a b c King C. Chen, China's War with Vietnam (1979) Dispute over the Paracels and Spratlys, pp. 42–48. ^ a b David Hancox and Victor Prescott (1995). "A Geographical Description of the Spratly Islands and an Account of Hydrographic Surveys Amongst Those Islands". Maritime Briefing. 1 (6): 31–32. 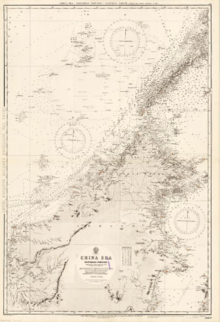 ^ "A correct chart of the China Seas : containing the coasts of Tsiompa Cochin China, The Gulf of Tonquin, Part of the coast of China and the Philippine Islands". Trove. National Library of Australia. ^ a b c d e f Severino, Rodolfo (2011). Where in the World is the Philippines? : Debating Its National Territory (illustrated ed.). Institute of Southeast Asian Studies. pp. 74, 76. ISBN 978-9814311717. ^ Samuels, Marwyn (1982). Contest for the South China Sea. UK: Methuen. p. 81. ISBN 978-0-416-33140-0. ^ Samuels, Marwyn (1982). Contest for the South China Sea. UK: Methuen. pp. 168–172. ISBN 978-0-416-33140-0. ^ Shavit, David (1990). The United States in Asia: A Historical Dictionary. Greenwood Press. p. 285. ISBN 978-0-313-26788-8. ^ Fowler, Michael; Bunck, Julie Marie (1995). Law, Power, and the Sovereign State. Pennsylvania State University Press. pp. 54–55. ISBN 978-0-271-01470-8. ^ Whiting, Kenneth (2 February 1992). "Asian Nations Squabble Over Obscure String of Islands". Los Angeles Times. p. A2. ^ Romero, Alexis (8 May 2013). "China fishing boats cordon off Spratlys". The Philippine Star. Retrieved 29 October 2013. ^ a b c d Kivimäki, Timo, ed. (2002). War Or Peace in the South China Sea?. Contributor: Nordic Institute of Asian Studies (illustrated ed.). NIAS Press. pp. 9–11. ISBN 978-8791114014. ISSN 0904-597X. Retrieved 10 March 2014. ^ Bateman, Sam; Emmers, Ralf, eds. (2008). Security and International Politics in the South China Sea: Towards a co-operative management regime (illustrated ed.). Taylor & Francis. p. 43. ISBN 978-0203885246. Retrieved 10 March 2014. ^ a b Wortzel, Larry M.; Higham, Robin D. S. (1999). Dictionary of Contemporary Chinese Military History (illustrated ed.). ABC-CLIO. p. 180. ISBN 978-0313293375. 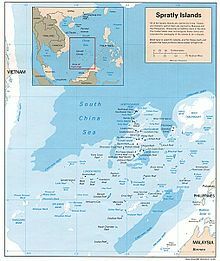 ^ a b Spratly Islands Archived 1 November 2009 at WebCite[full citation needed], Microsoft Encarta Online Encyclopedia 2008. All Rights Reserved. ^ a b Morley, James W.; Nishihara, Masashi (1997). Vietnam Joins the World. M.E. Sharpe. p. 124. ISBN 978-0-7656-3306-4. ^ Das, Darshana & Lotha, Gloria. "Spratly Islands". Encyclopædia Britannica. ^ "Taiwan's Power Grab in the South China Sea". ^ a b c Pak, Hŭi-gwŏn (2000). The Law of the Sea and Northeast Asia: A Challenge for Cooperation. Volume 35 of Publications on Ocean Development (illustrated ed.). Martinus Nijhoff Publishers. pp. 91–92. ISBN 978-9041114075. ^ a b Lin, Cheng-yi (22 February 2008). "Buffer benefits in Spratly initiative". Asia Times Online. Retrieved 14 May 2014. ^ Thao Vi (2 June 2014). "Late Vietnam PM's letter gives no legal basis to China's island claim". Thanh Nien News. ^ Malig, Jojo (17 July 2012). "Chinese ships eye 'bumper harvest' in Spratly". ABS CBN News. Retrieved 29 October 2013. ^ STRATFOR (14 July 1999). "Taiwan sticks to its guns, to U.S. chagrin". STRATFOR's Global Intelligence Update. Asia Times. Retrieved 10 March 2014. ^ Sisci, Francesco (29 June 2010). "US toe-dipping muddies South China Sea". Asia Times Online. Retrieved 14 May 2014. ^ Nguyen, Hong Thao (4 May 2012). "Vietnam's Position on the Sovereignty over the Paracels & the Spratlys: Its Maritime Claim" (PDF). Journal of East Asia International Law, V JEAIL (1) 2012. ^ Keck, Zachary (13 March 2014). "Second Thomas Shoal Tensions Intensify". The Diplomat. Retrieved 17 March 2014. ^ "A game of shark and minnow". The New York Times. Retrieved 17 March 2014. ^ a b Kastner, Jens (10 August 2012). "Taiwan pours cement on maritime dispute". Asia Times Online. Retrieved 10 March 2014. ^ Kastner, Jens (13 June 2012). "Taiwan circling South China Sea bait". Asia Times Online. Retrieved 14 May 2014. ^ Lee, Peter (29 July 2010). "US goes fishing for trouble". Asia Times Online. p. 2. Retrieved 14 May 2014. ^ Womack, Brantly (14 February 2013). "Rethinking the US-China-Taiwan triangle". Asia Times Online. Retrieved 14 May 2014. "Photo: Taiwan military exercises with Vietnam as an imaginary enemy generals admit Taiping Island". newshome.us. 5 September 2012. Retrieved 14 May 2014. "Taiwan holds live-fire drill in Spratlys: official". Taipei Mission in the Republic of Latvia. 23 April 2013. Archived from the original on 14 August 2014. Retrieved 14 May 2014. "Taiwan to stage live-fire drill on disputed island". Space Daily. Agence France-Presse. 1 March 2013. Retrieved 14 May 2014. "Taiwan to stage live-fire drill on disputed island". Business Line. Press Trust of India. 1 March 2013. Retrieved 14 May 2014. Yeh, Joseph (23 April 2013). "Drills held on Taiwan-controlled Taiping island in South China Sea". China Post. Retrieved 14 May 2014. "Vietnam Demands Taiwan Cancel Spratly Island Live Fire Drill". Bloomberg News. 23 August 2012. Retrieved 14 May 2014. "Vietnam protests Taiwan's fire drill exercise plan on island". thanhniennews. 27 August 2012. Retrieved 14 May 2014. "Vietnam protests Taiwan's fire drill exercise plan on island". Thanh Nien News. 23 August 2012. Retrieved 14 May 2014. "Taiwan to hold live-fire drill in Spratlys". InterAksyon. Agence France-Presse. 1 March 2013. Retrieved 14 May 2014. "Taiwan unmoved by Vietnam's protest against Taiping drill". Want China Times: "Knowing China through Taiwan". 5 September 2012. Archived from the original on 25 March 2014. Retrieved 14 May 2014. "Vietnam angry at Taiwan as it stages live-fire drill in the Spratlys". Philippines News. Agence France-Presse. 12 August 2012. Archived from the original on 25 March 2014. "Taiwan to conduct live-fire Taiping Island drill in September". China Post. 21 August 2012. Retrieved 14 May 2014. "Taiwan plans live-fire drill on Taiping in South China Sea". Taipei Times. 21 August 2012. Retrieved 14 May 2014. Carpenter, Ted Galen (28 February 2013). "Taiwan Challenges Its Neighbors". The National Interest. Retrieved 10 March 2014. Carpenter, Ted Galen (28 February 2013). "Taiwan Challenges Its Neighbors". The National Interest. Cato Institute. Retrieved 10 March 2014. Carpenter, Ted Galen (4 March 2013). "Taiwan Challenges Its Neighbors". Real Clear Politics. Cato Institute. Retrieved 10 March 2014. Carpenter, Ted Galen (28 February 2013). "Taiwan Challenges Its Neighbors". LibertyVoter.org. Retrieved 10 March 2014.
thanhniennews (27 August 2012). "Vietnam protests Taiwan's fire drill exercise plan on island". Vietnam Breaking News. (AFP) (12 August 2012). "Vietnam's angry at Taiwan as it stages live-fire drill in the Spratlys". Philippines News. Archived from the original on 25 March 2014. ^ Joseph Santolan (31 May 2011). "Chinese patrol boats confront Vietnamese oil exploration ship in South China Sea – World Socialist Web Site". wsws.org. ^ "Chinese Boats Cause Thousands of Dollars in Damage to Vietnamese Fishermen's Nets". ^ "South China Sea: Vietnamese hold anti-Chinese protest". BBC News Asia-Pacific. 5 June 2011. ^ "Người Việt biểu tình chống TQ ở Los Angeles" (in Vietnamese). BBC News Tiếng Việt. June 2011. ^ "It's West Philippine Sea". Inquirer.net. 11 June 2011. Retrieved 28 June 2012. ^ "Name game: PH now calls Spratly isle 'Recto Bank'". Inquirer.net. 14 June 2011. Retrieved 28 June 2012. ^ Jane Perlez (21 June 2012). "Vietnam Law on Contested Islands Draws China's Ire". The New York Times. ^ "Mahathir: China no threat to Malaysia". The Star. 27 April 2010. Archived from the original on 30 April 2010. Retrieved 14 May 2014. ^ Kazuto Tsukamoto (9 November 2011). "Malaysia's Mahathir says China is no threat". The Asahi Shimbun. Archived from the original on 17 May 2014. Retrieved 14 May 2014. Haslinda Amin (29 August 2013). Malaysia Breaks Ranks on South China Sea (video). First Up. Bloomberg. Retrieved 14 May 2014. "Malaysia splits with ASEAN on China Sea threat". Bloomberg. Business Mirror. 29 August 2013. Archived from the original on 17 May 2014. Retrieved 14 May 2014. ^ Camille Diola (25 June 2014). "Why Malaysia, unlike Philippines, keeps quiet on sea row". The Philippine Star. Retrieved 25 June 2014. ^ "Malaysia lodges diplomatic protest against intrusion at Beting Patinggi Ali". Bernama. The Rakyat Post. 15 August 2015. Retrieved 16 August 2015. ^ Ben Blanchard; Richard Pullin (18 October 2015). "Malaysia slams China's 'provocation' in South China Sea". Reuters. Channel News Asia. Archived from the original on 19 October 2015. Retrieved 20 October 2015. ^ Bray, Adam (16 June 2014). "The Cham: Descendants of Ancient Rulers of South China Sea Watch Maritime Dispute From Sidelines". National Geographic News. Archived from the original on 2014. Retrieved 3 September 2014. ^ Taoka, Shunji (21 September 2015). Translated by Rumi Sakamoto. "'China Threat Theory' Drives Japanese War Legislation". The Asia-Pacific Journal. 13 (38 no. 5). Retrieved 26 September 2015. ^ RRayhanR (8 October 2012). "Historical and 'human wrong' of Philippine Colonialism: How not to resprct historic human-rights of Bangsamoro and China?". mnlfnet.com. Moro National Liberation Front (Misuari faction). Retrieved 16 May 2014. ^ "Impact of possible China-Philippines war within Filipino-Moro war in Mindanao". mnlfnet.com. Moro National Liberation Front (Misuari faction). 11 August 2012. Retrieved 16 May 2014. ^ "Press Release: Arbitration between the Republic of the Philippines and the People's Republic of China: Arbitral Tribunal Establishes Rules of Procedure and Initial Timetable". PCA. 27 August 2013. Retrieved 13 July 2016. ^ "Press Release: The South China Sea Arbitration (The Republic of the Philippines v. The People's Republic of China)" (PDF). PCA. 12 July 2016. Retrieved 13 July 2016. ^ Perez, Jane (12 July 2016). "Beijing's South China Sea Claims Rejected by Hague Tribunal". The New York Times. ^ Chow, Jermyn (12 July 2016). "Taiwan rejects South China Sea ruling, says will deploy another navy vessel to Taiping". The Straits Times. ^ The Taiping Island Airport was completed in December 2007, ("MND admits strategic value of Spratly airstrip." Taipei Times. 6 January 2006. p. 2 (MND is the ROC Ministry of National Defense)), and a C-130 Hercules transporter airplane first landed on the island on 21 January 2008. ^ Bong Lozada (18 June 2014). "Air Force to repair Pagasa Island airstrip". Philippine Daily Inquirer. Retrieved 26 December 2016. ^ a b "Vietnam Responds". Center for Strategic and International Studies. 1 December 2016. Retrieved 26 December 2016. Bonnet, François-Xavier (2012) Geopolitics of Scarborough Shoal, Irasec, 14. Bouchat, Clarence J. (2013) Dangerous Ground: The Spratly Islands and U.S. Interests and Approaches, Strategic Studies Institute and US Army War College Press, Carlisle, Pennsylvania. Cardenal, Juan Pablo; Araújo, Heriberto (2011). La silenciosa conquista china (in Spanish). Barcelona: Crítica. pp. 258–261. ISBN 9788498922578. Hogan, C. Michael (2011) "South China Sea", Encyclopedia of Earth, National Council for Science and the Environment, Washington, D.C..
Menon, Rajan (11 September 2012) "Worry about Asia, Not Europe", The National Interest, Issue: Sept–Oct 2012. Ji Guoxing (October 1995), Maritime Jurisdiction in the Three China Seas: Options For Equitable Settlement (PDF), Institute on Global Conflict and Cooperation. "Analysis Brief : Spratly Islands". US Energy Information Administration.